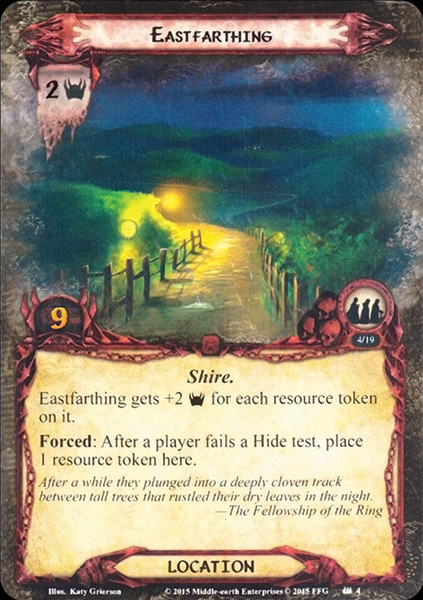 The Shire was a region in Eriador inhabited by Hobbits. The Shire is described as a small but beautiful and fruitful land, beloved by its inhabitants. The Hobbits had an extensive agricultural system in the Shire, but did not proceed with industrialization. Various supplies could be found in the Shire, including cereals, fruit, wood and pipe-weed (a favourite treat of Hobbits). The Shire was quite densely populated in parts with many villages and a few towns, but it still was open enough to allow for wide forested areas and marshes. There were green, rolling hills and freshly tilled earth, along with gardens and flower boxes on window sills. Thanks to the protective presence of the Rangers of the North in the lands of the former Arnor, the Shire for centuries ignored the wide world outside, despite being traversed by the Great East Road. From the west to the east, the Shire originally measured 40 leagues (120 Númenórean miles) from the Far Downs to the Brandywine Bridge. From the north to the south, it measured 50 leagues (150 Númenórean miles) from the northern moors to the marshes in the south. The total area of the shire must have extended roughly about 20,000 square miles. In S.R. 1452, King Elessar gave the Westmarch to the Shire-hobbits as a gift. This extended the western boundaries of the Shire to the Tower Hills. Buckland, to the east of the Brandywine, remained an independent region occupied by Hobbits. The Shire was a fertile and well-tilled part of Arnor, but deserted during the waning days of the Kingdom when it was known as the splinter-realm of Arthedain; it had been the hunting grounds of the King of Arnor. 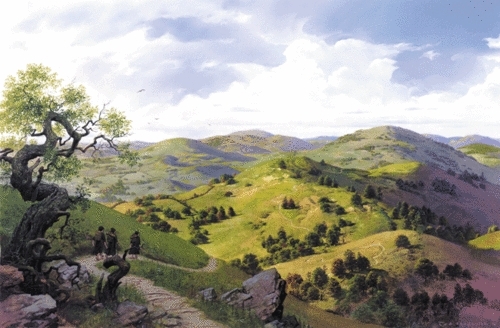 The Hobbits (who lived in Dunland and parts of depopulated Cardolan and Rhudaur) got official permission from King Argeleb II at Norbury (Fornost) to settle the lands. This was finally done in Third Age 1601 (Year 1 in Shire Reckoning) by Hobbits from Bree, led by the brothers Marcho and Blanco. By 30 years later, almost all of the Hobbits of Middle-earth could be found in the Shire. The Shire-hobbits considered themselves as subjects of the King, at least nominaly, considering the isolation of their country. Nevertheless the Hobbits sent some support troops to the great battles Arnor fought against Angmar. After the fall of Arnor, the Shire remained a minor but independent political unit and the title of Thain was established to fill the absence of a Kingship. Its small size, relative lack of importance, and brave and resilient Hobbit population made it too modest an objective for conquest. More important was that the Shire was guarded and protected by the Dúnedain Rangers of the North (and Gandalf), who watched the borders and kept out intruders. The only strangers to enter the Shire were the Dwarves traveling on the Great East Road that ran through the Shire to and from their mines in the Blue Mountains, and the occasional Elves on their way to the Emyn Beraid or the Grey Havens. In T.A. 2340 the Oldbucks of the Marish crossed the Brandywine because of overpopulation and founded Buckland. However Shire faced its adversities since it was inside the range of the Great Plague of T.A. 1636, and Goblins from Mount Gram invaded the Shire until they were driven out after the Battle of Greenfields (T.A. 2747). The Shire also suffered because of the Long Winter (T.A. 2758) soon followed by the Days of Dearth (T.A. 2760) and the Fell Winter (T.A. 2911) when White Wolves entered the Shire. During the War of the Ring the Shire was first visited by the Nine Ringwraiths and then, while the Rangers were off to the War, the Shire was defenseless. It was captured by Saruman and Lotho Sackville-Baggins who lead evil Men. It was liberated with the help of Frodo, Sam, Merry and Pippin after the end of the War through their victory at the Battle of Bywater. But the damage which Saruman caused by forced industrialization was undone by the Hobbits' efforts. The Shire was restored with soil from Lothlórien, given to Sam by Galadriel. T.A. 3021 was considered to be the most productive and prosperous year in their history. 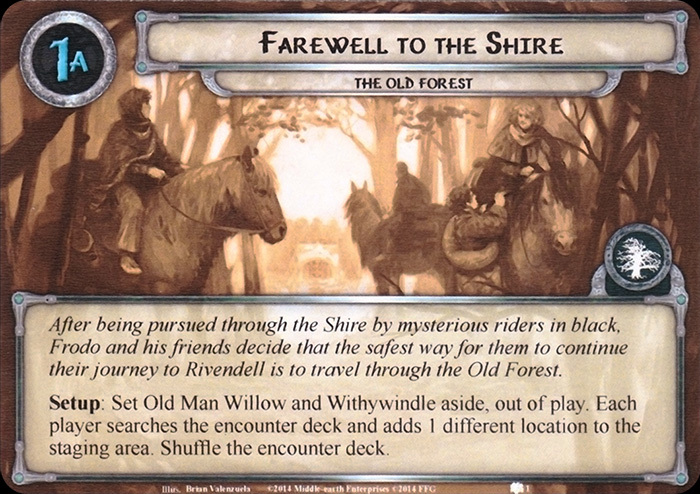 With Aragorn's return as the King of Arnor and Gondor, the Shire became in Fo.A. 6 a Free Land, protected enclave inside the Reunited Kingdom. He is known to have issued an order that forbade the entrance of full-sized Men into the Shire. In Fo.A. 31 King Aragorn granted Buckland officially as a part of the Shire named Eastmarch, and also extended the land westwards to Emyn Beraid; this land was named Westmarch. Initially, The Shire was a part of Arthedain. 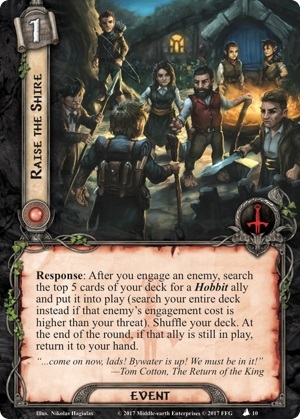 The Hobbits considered themselves as subjects of the King and only after the fall of Arnor, the Shire became an independent political unit led by the Thain from Tuckborough who was the head of the important Took clan. While nominally the Thain ruled over the four Farthings, in practice authority was so decentralized that the title was seen as more of a formality and ceremonial. Official of the Shire was the Mayor of Michel Delving in the White Downs (by extension seen as the mayor of the Shire). The Mayor's chief duties were serving as postmaster of the Shire's Messenger Service, charging the Watch and presiding at fairs. Finally, the Master of Buckland at Bucklebury controlled Buckland. 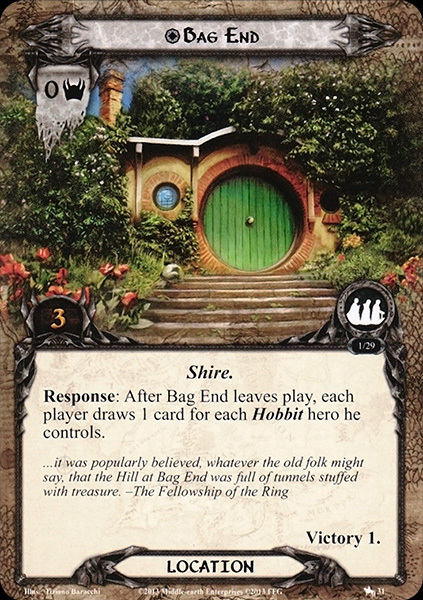 The sole law enforcement officials in the Shire were the Shirriffs. Their job was to protect the Shire from trespassers more than anything. There were three in each Farthing, and were distinguished from 'civilians' by a feather worn in their caps. The Bounders were the land's border-guard, charged with turning back unwanted people or beasts, and their number varied according to need. 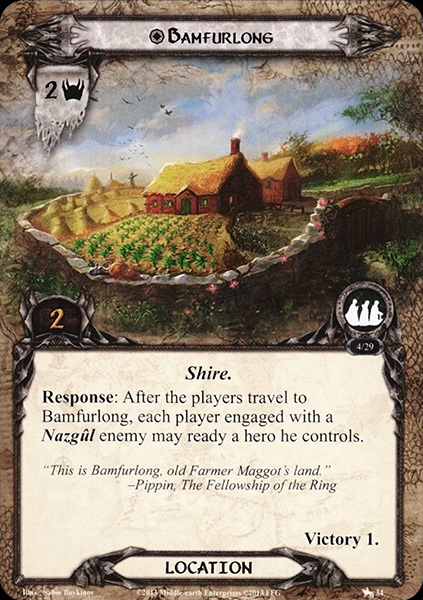 The Shire was originally divided in four Farthings (Northfarthing, Southfarthing, Eastfarthing, and Westfarthing), but Buckland and later the Westmarch were added to it. Within the Farthings there are some smaller, unofficial divisions such as family lands: the Tooks nearly all live in or near Tuckborough in Tookland, for instance. In many cases a Hobbit's last name indicates where their family came from: Samwise Gamgee's last name derives from Gamwich, where the family originated. Outside the Farthings, Buckland itself was named for the Oldbucks (later Brandybucks). See further Regions of the Shire. A 'shire' (Old English scír) is an organised region with a 'county-town'. Tolkien notes that in English, OE scír replaced the Germanic word for district gē (cognate, German Gau, 'valley, district') and in English was reduced to an element for a few old place-names, like Surrey (from Suðer-ge 'southern district'). On Tolkien's maps, the Shire is located at about the same position as England is on modern European maps and has been cited as an example of Deep England ideology (though, of course, England is on an island while the Shire is inside the continent). Throughout the narrative, Tolkien also implies numerous points of similarity between the two, such as weather, agriculture and dialect. One can also see England as Tolkien's source of inspiration for the Shire in its very name. According to Paula Marmor, the hobbit brothers Marcho and Blanco names are related to horses, parallel to Hengest and Horsa, legendary leaders who brought the Saxons to Britain. Hengest was the founder of Kent whose geography is similar to the Shire (North Downs above, hills to the west, water to the east and marshes to the southeast). The industrialization of the Shire was based on Tolkien's witnessing of the extension of the Industrial Revolution to rural Warwickshire during his youth, and especially the deleterious consequences thereof. The rebellion of the hobbits and the restoration of the pre-industrial Shire may be interpreted as a prescription of voluntary simplicity as a remedy to the problems of modern society.